Why Use Liquid Roofing Waterproofing? There are many benefits to using liquid waterproofing systems and there are literally millions of square meters used in the country to prove it! Liquid waterproofing systems provide one of the most cost effective methods for making a new or existing roof waterproof. Correctly installed and maintained they provide a long term solution. 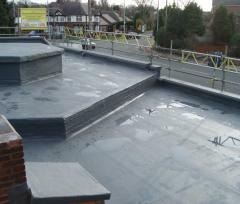 In refurbishment situations liquid systems can provide savings of upto 70% on any roof replacement cost. At Castle Contractors we can offer liquid waterproofing systems for roofs, balconies, walkways and car parks, thus providing the benefit of a watertight surface that is also hard wearing.